I'll be honest--I'm not and never was a Trekkie. The Star Trek phenomenon just wasn't my bag, but that doesn't mean I can't appreciate its rightful place in pop culture history. So when one of its stars, Leonard Nimoy, passed away yesterday at the age of 83 I was not immune to feeling a sense of loss and sadness, particularly for my fellow retro fans who did grow up watching Mr. Spock. The tributes were everywhere I was online yesterday and as it turned out, Nimoy is being remembered for a lot more than his logical, pointy-eared sci-fi character. Like most actors, he struggled to gain a steady career, appearing in several plays, TV series, and movies before Star Trek made him a household name in 1966. Years later Nimoy recalled that the show was "the first time I had a job that lasted longer than two weeks and a dressing room with my name painted on the door and not chalked on." 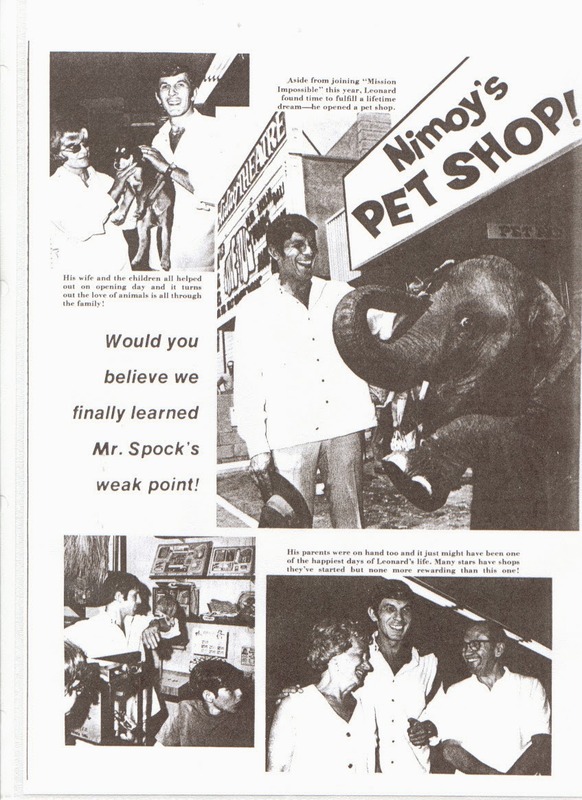 An animal lover, he opened up his own pet shop in Canoga Park in 1969 called Leonard Nimoy's Pet Pad, specializing in mostly exotic animals. It only lasted a year but at home, Nimoy was a doting pet dad to cats, dogs, and even a tortoise. He was a multi-talented, creative man who did it all: besides acting, he directed movies (a couple of the Star Trek films and even the '80s comedy Three Men and a Baby, among others), he wrote poetry, he starred in a music video with The Bangles and recorded music of his own. How great is this performance of The Ballad of Bilbo Baggins, with its gaggle of elf-earred '60s chicks cavorting with Nimoy? Mostly, though, I think Nimoy is being remembered this morning for his humanitarian efforts and how he treated other people. Ultimately, no matter how famous you are, that is what you are most remembered for when you pass away. His co-star and lifelong friend William Shatner says Nimoy was a brother to him. 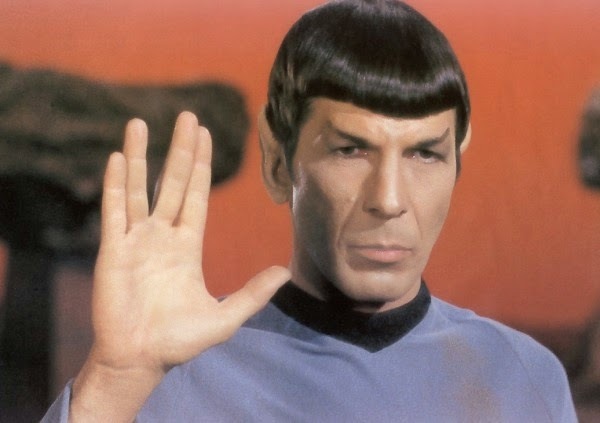 It shouldn't be surprising, then, that he was responsible for dreaming up Mr. Spock's infamous Vulcan salute and saying; it was partly inspired by the Jewish kohanim he witnessed during his childhood when they bestowed blessings. May the Lord bless and keep you and may the Lord cause his countenance to shine upon you. May the Lord be gracious unto you and grant you peace. "Live long and prosper." He was much more than an actor, he will be missed... thank you for your post. Thank you, Jeremy, for your comment. Thanks for the story Pam. I am an original STOS trekkie from the 60s. 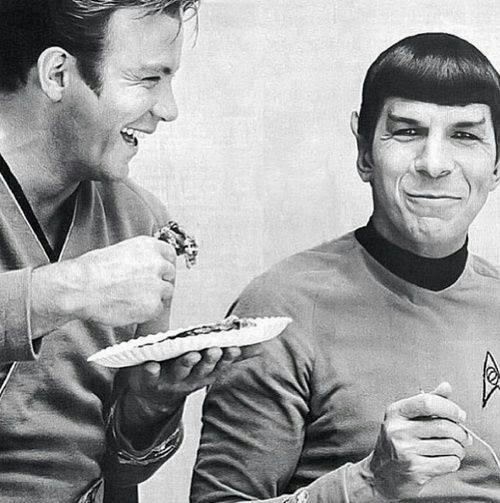 Leonard Nimoy defined a role and influenced thousands of people. I did enjoy his work outside of Star Trek too. That was a beautiful tribute, Therese. Thanks for sharing. How fortunate you were to get your picture taken with him; a memory to treasure for sure!